While the buff is the same as Großes Pandarenfestmahl, this will serve 10 people instead of 25; plan ahead and pay attention to which one you're making so you don't waste mats. But the feast is giving only 275.What is the purpose of the feast? I've yet to make one of these, but from the tooltip above, these don't appear to be BOP either - money to be made form cooking profession once again? only offer 250 of a useful stat. However, if you make your own food, you get the benefit of extra stat points. These feasts will give an additional 25 to your primary stat if you've gotten that cooking specialization up to 600 (making the feast 300, or equally good as any other food out there). As an example: If you're going to get intellect from the feast, and you're 600 in the Way of the Pot, you'll get 300 intellect instead of 275 (stamina increases from 415 to 450 if you have the Way of the Oven). Completing that quest grants you 10 ironpaw token which is the currency needed to buy this or the 25man version of the feast. Contrary to the popular belief (or rumours, whatever) this does NOT give you +300 stats if you are maxxed in all cooking ways (Master of the Ways). You need 7 Ironpaw tokens for cooking this once, when you get everything via tokens. You need 5 Ironpaw tokens, when you get everything beside Pink Turnip via tokens and plant the Turnip yourself. One player at exalted can make 1,6 Ironpaw tokens per day via Motes (Songbells). So you need 4,3 players per day to cook this feast one time only from your farm when only using tokens. Or 3,2 players to plant Songbells and one player to plant 50 Turnip and 6 Songbells. So you need 4 players at exalted farming one day to get this feast cooked for one time. At the time of this post I cannot place this item into the Portable Refrigerator. I've submitted a bug report in-game with the hope that it's an oversite. I think these mats for both 10 man and 25 man are little outrageous. Just to buy a stack of 20 off auction house for just the 10 man it would close around 2000 gold. To farm the mats yourself it would take a couple hours at the least if not longer. This is just for a stack of 20? Plus you have to use 4 tokens which you only get 1 of those a day. This is just to much farming for a cooking buff. I understand you can get guildies to help farm the mats, its still a pain. If the mats are that time consuming it should be the best buff in the game. I do think if you raid and your on progression bosses everyone should have their 300 food buff. (and farm their own food) But a lot of players don't have the time or are just to lazy. A good way to farm these is to camp and kill "The yowler" rare NPC in townlong stepps. he has a chance of dropping the big bag of food which contains 20 banquets and 20 great banquets. 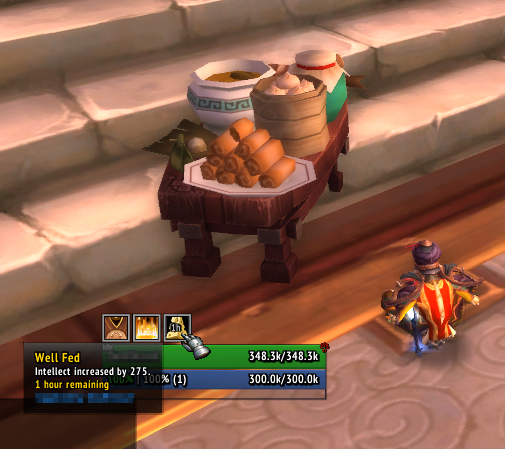 you need at least 10 pandaren meat to make a stack of 5 in one go. Benutzen: Richtet ein Pandarenfestmahl her, das bis zu 10 Leute in Eurem Schlachtzug oder Eurer Gruppe sättigen kann. Stellt im Verlauf von 20 sec 11386 Gesundheit und (0 / 5 * 20) Mana wieder her. Ihr müsst beim Essen sitzen bleiben. Wenn Ihr mindestens 10 Sek. mit Essen verbringt, werdet Ihr satt und ein für Euch nützlicher Wert wird 1 hour lang um 15 erhöht.